Well, the Disney trip went off with a MASSIVE success - something I will never forget in my lifetime - the first trip with my miracle boy. And we were able to do it cheaply and not feeling like we left out a thing. But that's for another post. Which I will get to soon - promise. And I'm sorry that I haven't written anything but work has been INSANE since that time and I'm still trying to catch up. 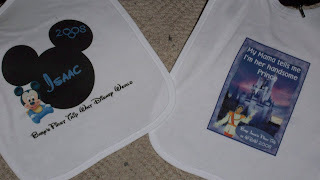 But in the interim, I wanted to announce one discount you don't often see - a freebie from DISNEY!!!! Yes, for those of you who still admit to having birthdays . . . Disney will give you a free day in the park on your actual day. 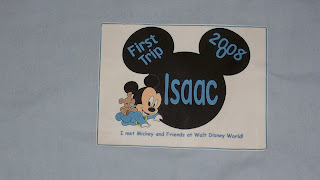 Or, if you are one of the few who are lucky enough to have an annual pass to disney or are already paying for a package which includes tickets for your entire stay, they will give you a gift card to use ONLY on your birthday, in the amount of a one day ticket (adult price if you are an adult, kid price if you are a kid) to spend on merchandise - but there are restrictions. Here is the link to give you the details. My Disney Creations, Thanks to the Disboards, Part 1. 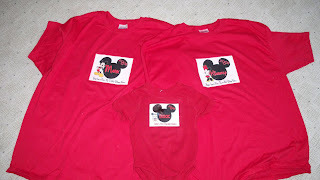 These are the family "outfits" I made, a t-shirt for Mr. Bean, one for me and a onesie for Lil' Bean. One of the family outfits we're going to wear for pictures at Chef Mickey's and the other is to wear for the Magic Kingdom, I haven't decided which - any suggestions? If you want to see a picture close up, just click on it. 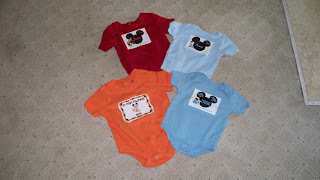 These are the onesies I made for Lil' Bean. The light blue ones are for the trip to Disney at the airport and say "I'm on my way to Disney and it's my first time!". The red one is for the trip home and says "I'm skating my way home from Disney!" because it has a hockey mickey on it (the sport Mr. Bean wants Lil' Bean to play). 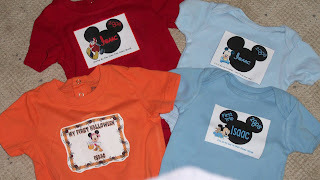 The orange one is actually for Halloween for Lil' Bean to wear during the day before he changes into his costume. 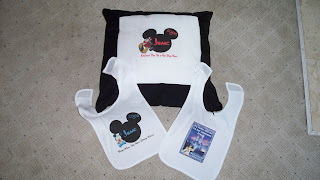 Here are my bibs and pillowcases! I made the light blue pillowcase. So, as I said in a previous post, Mr. Bean, lil' Bean and I are doin' it Disney style this weekend. I'm SOOO excited because it is Lil' Bean's first trip and I never in a million years thought this day would come. As my original readers know, Mr. Bean and I are Disney fanatics, having gone twice while dating, on our honeymoon and almost every year since. But, with all of our fertility issues, on my part, we never thought we would get to share the joy with our very own child. So, now that this day is finally here, we can't wait! In true discounting style, we are going now because we get free dining. That's right folks, all of our food is FOR FREE! This is actually our fourth year doing this. It makes life much easier not having to worry about paying for meals. We get one table service restaurant meal (which includes entree, drink and dessert), one counter service meal (sandwich/salad, drink, dessert) and one snack, which we usually use for breakfast (what is it about vacations that make you hungry for all three meals?). It's more food than you could possibly ever need, and still free! 1. I need water for Lil' Bean for his formula and for us to not dehydrate. Florida water is YUCKY; but I don't want to pay $2.50 per bottle at Disney world. So what did I do? I ordered 24 1/2-liter bottles from Costco and had it delivered to my resort Wilderness Lodge for the low price of $7.80, including shipping! 2. I'm packing his formula, diapers, wipes and food in the suitcase so I don't have to buy it there. 3. I joined a group who pitched in together for the Disney Photopass CD so we could have the special Disney photographers take a zillion photos of us as a family in front of Cinderella's castle and more. So instead of paying $100, I only paid $16.99. And I can print as many or as little photos as I want. Even better, I was able to get in on a special photo session at the Disney Resort we are staying which is 30 minutes with a photographer with our family and only had to pay $25 instead of the normal $75 they charge because we bought the photopass CD early. 4. And my most fun project of saving items: I made some of our clothes and other items! 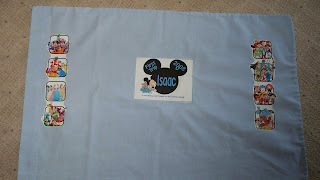 You see, for Lil' Bean's first trip, I wanted to make some special disney t-shirts, onesies, bibs, and pillow cases to commemorate the event. 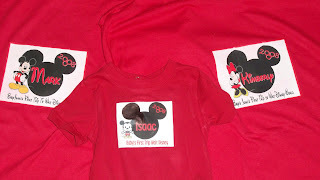 So I had some great help from my friends at the Disboard create awesome designs so we could have "family" outfits for pictures at Disney I talked about in paragraph 3. 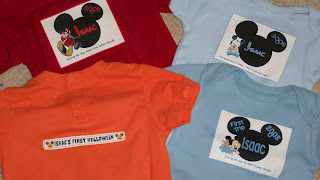 I then bought (1) 6 onesies for Lil' Bean for $2 each at Wal-Mart; (2) a light blue pillowcase for $2.50 from Wal-Mart (for characters to autograph at the Liberty Tree Tavern, Chef Mickey and Crystal Palace character restaurants); (3) 4 t-shirts for Mr. Bean and I for only $2 each at A.C. Moore when they had them on sale; and (4) I bought transfer paper from A.C.Moore, five sheets for $5.98, reg. $10.98. I bought 3 packets, in case of mistakes as this was my first time. I also cheated and had some designs given to Cafe Press who made me two bibs for $8 each and one really nice pillow for $15. The rest I made myself, using a regular printer and a cheap iron. It was surprisingly easy to do in spite of my initial fear in making them and ruining a shirt or something. So, see how they turn out in the next post! I'm going to try a new series called "Scenario Sunday". Since I started all of this coupon craziness, all my Sundays are the same: (1) wake up early, (2) feed lil' Bean, (3) make the much needed coffee, (4) cut out all the new coupons in my two papers while lil' Bean plays and watches me in action, (5) coordinate my coupons with the savings from my fave stores CVS, Rite Aid, Target and Wal-Mart using Hot Coupon World, Money Saving Mom, A Full Cup and others I have listed before such as I Heart CVS and I Heart Rite Aid, (6) wait for Mr. Bean to get up, and (7) off I go to shop, shop, SHOP!!! So I figured I would try to add to the list "blogging" and give you the scenarios I came up with that day and how they turned out. One caveat, however, next week I won't be able to do this because we will be off Disney World!!! So anyway, here is what I did today. First, I went to CVS. I did 5 separate transactions. I went in with a $3 ECB and a $2 ECB. Total OOP $2.07, received $2 in ECB's for Pantene. Total OOP $4.18, received $5.99 in ECB's for Covergirl. Total OOP $4.84, Receive $4 in ECB's for Colgate. 4. 2 Covergirl Outlast lipstick, buy one for $9.99, get one free. 1 Revlon clear nailpolish for $4.59. Total: $1.31 OOP, received $6 in ECB's for Neutrogena. So I spent a total of $12.84 and have $12 in ECB's left. I then went to Rite Aid. I actually had to go to two because the first Rite Aid didn't have the best deal of the week, but I found it at the second. So I will get a total of $31.72 for these two trips. So, I'm even steven. Well, actually ahead by 3 cents. Also, I will be getting a $10 Rite Aid gift card for spending $30 for pantene, crest and L'Oreal as well as a $20 gift code to ebags for a free bag. Yippy! So that's all folks! What were your Sunday scenarios? For a total of $100 in coupons. So, if I hadn't bought the formula (which I wasn't planning to buy but it had 25% more free, i.e. 32.5 oz. for the price of 25 oz. which I hadn't seen before); and I hadn't bought the stroller rain cover (which I had been looking for but all the previous ones I had seen were $20+ which I think is just too expensive), I would have only paid $8.99 of which $7.26 was tax. Thanks Money Saving Mom and thanks Wal-Mart! As a side note, the total amount OOP (out of pocket) includes taxes ($8.27), bottle deposits ($7.80 of which I will get back as I return them) and one prescription for $3.46. Thus, I really paid $39.89 for the actual products, of which there are 74 of them, including 13 cases of pepsi soda, shampoo, condition, toothbrushes, toothpaste, feminine products, candy, medicine and more. So, I essentially paid $40 for $400 worth of stuff and still have $5 in ECB's to use next month. What a bargain! Just a quick note to tell you what Rite Aid is paying me for shopping there in the month of August from the rebate: $49.14. How much in coupons did I use? $55.83 (weird number b/c some coupons were B1G1 - i.e. buy one, get one free). I'll post soon about my OOP expenses v. worth of products for the month of August at CVS. As you all know, I've been in hiding since my February 1, 2008 post talking about changes and last things. And boy, was I right. Things have been crazy and happy and expensive and priceless and thrilling and scary and . . . Well, you get the drill. I have the most amazing little boy in the whole wide world and he is now 6 months old - where did the time go? I was lucky enough to take three months off to spend with him - and boy did I need it! Talk about a learning process! I went back to work and am still getting used to the drill of bringing my handsome prince to "school", going to work, getting my cheeky monkey again and feeling like a rock star when he sees me for the first time, and getting things ready to start all over again. We bought a house - I got MASSIVE nesting instincts when I had my baby shower - the place just felt way too crowded and I needed to move NOW - it's weird, I heard about the nesting instinct but never believed in it until it happened to me. Looked at the house two days before I gave birth and bought it four days after I gave birth - we would have bought it earlier, but I was in the hospital for four days b/c I had a c-section. It was the first place we looked at; and I LOVE it! We bought a new car so baby would be safe and the old car (1999 with 150,000 miles on it) just wasn't going to pass inspection. And of course bought new furniture, etc. for the house. So needless to say, we spent a lot of money and are in major saving mode right now. Which has led me to my newest obsession: couponing and getting stuff for free. And my two favorite places to do it are at CVS and Rite Aid. Essentially, by using the combinations of coupons and great deals from there, I get things for free or for at least VERY LOW MONEY. So I have a huge stock of toothpaste, toothbrushes, cleaning supplies, shampoo, conditioner, razors, feminine supplies, shaving cream, soda and medicine that I paid almost no money for; and in some cases, they have paid me to take. To get an understanding on how to do it, I would recommend two great blogs: I heart CVS and I heart Rite Aid. Another place I use consistently is Hot Coupon World which also advises me of great deals at Target and my Price Chopper grocery store. So, I'm not going to tell you how to do it, I'm just going to direct you there as I couldn't do as well as them at the explanation. What I will do, however, is post my weekly shopping scenarios to show how I did; and hopefully, it will help you. 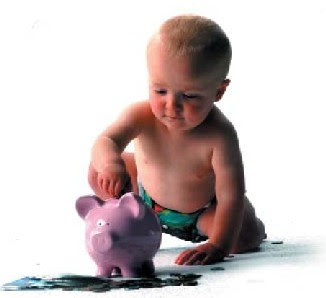 Also, this blog is going to become more of a "saving moola" blog as my baby boy and saving money are my two big things right now. I'm somewhat new at this - I've been at it one month. But I love puzzles so I do the deals, especially at CVS, accordingly. I don't get a ton products, just what we as a family may need, but I thought my scenarios might help others. So I spent a total OOP of $11 and I still have $10 in ECB's to use next time. So I paid only $12.21 for $53.75 worth of products. Last Days . . .
10. last days of worrying only that I'm clean. Any other last days I should be celebrating? Come on parents, help me out here!